QB Aaron Rodgers was hurt early in this one, and the Vikings would build a lead off of two HB Jerick McKinnon scores, one rushing and one receiving. However, backup QB Brett Hundley was able to lead two scoring drives, one a touchdown-scoring drive on a pass to WR Davante Adams and the other to secure a field goal to keep the scoring deficit to 4 points at halftime. The Packers would not find the scoreboard in the second half however, and the Vikings would kick three Kai Forbath field goals to extend their lead and eventually win 23-10. With that, we give you our PFF exclusive takeaways from the contest for each team. Rudolph turned in a very strong performance as a run blocker on the edge, allowing the Vikings the luxury of being able to get yards in the run game even with the interior offensive line struggling to get much movement. In the passing game Rudolph provided some moments to get the passing game enough to beat the depleted Packers. Keenum had his worst game of the season against the Packers. Thankfully for the Vikings, he did not have to provide a lot. 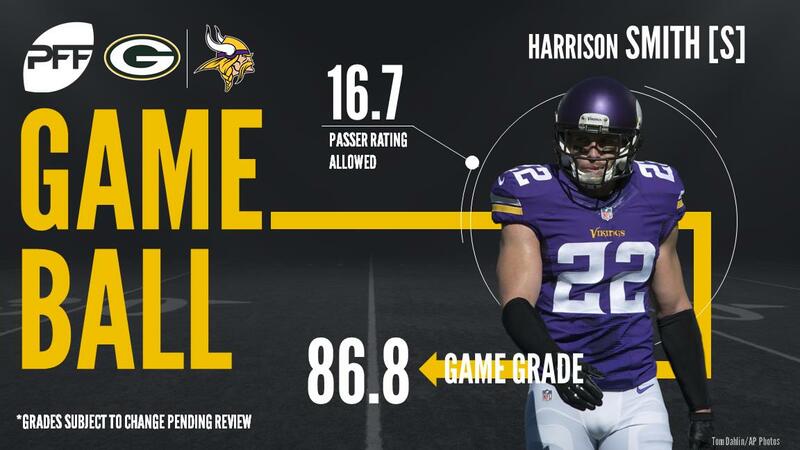 Keenum gained a good chunk of yards on passes over 20 yards, with 68 yards on 3 deep catches, which was enough to get the Vikings offense enough points to beat the Aaron Rodgers-less Packers. However there was multiple plays that could have been intercepted and would have changed the game drastically if the Packers defense had been able to take advantage. Smith was all over the field on Sunday, impacting the game a number of ways. Rushing the passer on well timed and executed blitzes, Smith totaled two sacks, both on third downs that ended drives for the Packers. In coverage, Smith allowed just two catches for 12 yards on four targets, with the highlight play of the game on a one-handed interception as the underneath defender in the fourth quarter. Robison took advantage of the Packers offensive line injuries, putting pressure on QB Brett Hundley throughout the game. Robison had 29 pass-rushing snaps, finishing with 3 QB hits and 3 QB hurries, with many of them leading to inaccurate throws from Hundley. The Packers’ last snap of the game saw Robison hitting Hundley as he let the ball go, with the ball floating up to Trae Waynes to finish the game. With Aaron Rodgers going down on the second series with a right collarbone injury, Hundley stepped in and struggled get a rhythm and move the offense. Behind a banged-up offensive line, Hundley was under pressure on 16 of his 38 dropbacks, posting an 8.1 passer rating and being sacked three times under duress. Hundley struggled with accuracy throughout the game, firing 3 interceptions in the process. Nelson was one of the few bright spots in the game for the Packers offensively, hauling in six of his nine targets for 60 yards. Nelson worked outside with a number of timing routes as well as a well-placed back-shoulder throw from Hundley for 26 yards, the Packers’ biggest gain on the day. Two of Hundley’s interceptions came on poor throws/decisions in Nelson’s direction. Clark was unstoppable in the run game, recording 6 run stops on 25 snaps as he and Mike Daniels dominated the interior of the Vikings offensive line. On top of his game as a run defender, he was able to record a hit and 2 hurries. As the Packers defense has been going down with injuries, one of the constants has been Clinton-Dix. Against the Vikings, Clinton-Dix was effective in coverage, where he was targeted 5 times and allowed 1 catch for 16 yards and 1 pass deflection.